Ultima 601 is designed to extend service life where abrasive materials (i.e. glass, coke, coal, wood chips, bottom ash, rice, and stone) can cause premature wear. With its 600BHN I.D. and 300BHN O.D. hardened surfaces, Ultima 601 becomes the ideal abrasion resistant product that can handle the rigors of extreme maintenance problems. 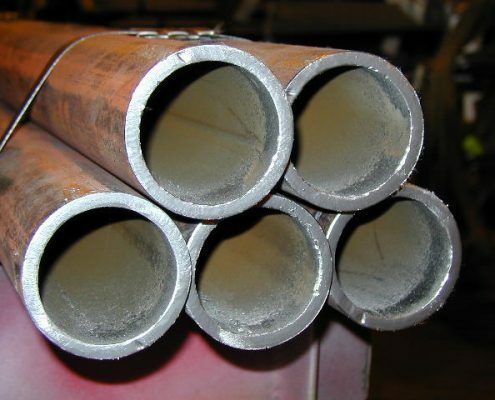 This specialty AR600 wear pipe will improve the reliability and productivity of your conveying system, as well as, outperform mild steel low carbon pipe but up to a factor of 6X times. Wall thickness wear may be monitored by use of ultrasonic equipment to gage remaining service life without disassembling the line. When wear is detected, simply rotate the pipe section to start the service life over, without replacing the pipe. Ultima 601 is the ideal combination of economy and service performance. Custom tees, wyes, laterals and reducers are offered to control flow of material through the system. Proper selection is dictated typically by certain variables including flow rates and permissible pressure requirements. Long lengths available up to 40 feet (call for additional details). Excellent in service temperature up to 450°F. Call or email us for a quote. Excellent Hardness – offers 600BHN I.D. and 300 BHN O.D. hardness levels that provide maximum serviceability. Abrasion Resistant – designed to resist many forms of sliding abrasion and moderate levels of impact. Adaptable – can be customized for your specific requirements; including weld rings, slip-on flanges, and roustabout couplings. 3″ SCH 40 x .216 Wall x 3.50 O.D. 4″ SCH 40 x .237 Wall x 4.50 O.D. 5″ SCH 40 x .375 Wall x 5.583 O.D. 6″ SCH 40 x .280 Wall x 6.625 O.D. 8″ SCH 40 x .322 Wall x 8.625 O.D. 10″ XH* x .500 x 10.75 O.D. 12″ XH* x .500 x 12.75 O.D. 14″ XH* x .500 x 14.00 O.D. 16″ XH* x .500 x 16.00 O.D. 18″ XH* x .500 x 18.00 O.D. 20″ XH* x .500 x 20.00 O.D. 6″ SCH 80 x .432 x 6.560 O.D. 8″ SCH 80 x .500 x 8.644 O.D. 10″ SCH 80 x .594 x 10.730 O.D. 12″ SCH 80 x .688 x 12.750 O.D. 14″ SCH 80 x .750 x 14.00 O.D. Note: Induction hardened pipe contains retained internal stresses. Never cut this product lengthwise, as serious injury or property damage might result. Many options are available for end attachments. Proper selection, or combination of options, is dictated by maintenance considerations and performance expectations. Tuf-Pipe™ 600 is the past protected tradename of North American Steel Company. 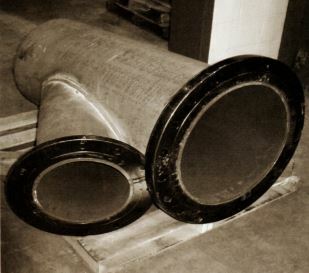 Max-Wear Pipe is the past protected tradename of Ludlow Steel Company.